Far Cry 5 Official Reveal Trailer | Nerd Much? 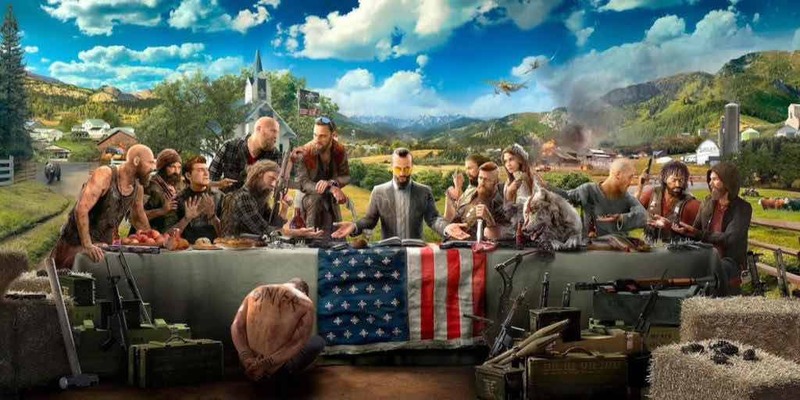 Ubisoft has unveiled the first official trailer for Far Cry 5 at their E3 2017 conference. The trailers features the beautiful American country side, most especially a ranch town in what is essentially the middle of nowhere. The cinematic trailer shows us the fanatic cult that took over a small town with an aim to “cleanse” it. Mainly with guns. We see the taken over church, with the angelic singing of the cult’s leader. Cages hang from the rafters, and guns are in the hands of every member of the congregation; a light contradiction within such a respected place. Far Cry 5 will be available February 27, 2017 exclusively on the PS4. In the game, it is up to the player’s character to get yourself and people of the town to safety. Many hostage situations are abound, much like Far Cry 4, and you’ll have “fangs for hire” as well. This is your trusty puppy, who is able to kill people for you and steal their loot. You’ll be getting air support too, and help from friends if you decide to play in co-op mode. One of the most humorous deaths in the trailer is when the player kills some via farm truck. A Doomsday Prepper Pack is available with the deluxe and gold editions of the game. For more of the latest E3 2017 announcements, stay tuned to Nerdmuch.com.